Privy Doll loves a good find and an upcoming designer nonetheless. A name you must know. Nettie Kent Jewelry line. The entire line is beautiful with vintage inspired elements. Leather, gold bracelets and earrings are included in the line, but my personal favorite and PRIVY find is the vintage button rings. I adore the vintage look of these but are so modern at the same time. I have personally had an obsession with old buttons since as long as I can remember so its no wonder I was blown away when I first saw these. Get to know the designer behind the line and learn about her love for vintage and the 1970's. PrivyDoll:Love the vintage touch on your line, what vintage pieces inspire you? Nettie Kent: " I am a collector, and when it comes to vintage clothes and jewelry, I could almost be called a hoarder... I am an avid small town thrift shopper and when I used to have more free time I was an eBay addict. I love old pieces, my vintage jewelry collection is filled with pieces I have scavenged over the years, really great old chains and broaches, tons of single earrings, and rings galore! Some of it I have picked up with reworking in mind others just because they were beautiful. Right now on my inspiration board over my work table I have tons of old chains and 6 different bolo ties I have collected, also lions lots of lions, belt buckles and buttons and pins..."
PrivyDoll: The Button rings are fabulous. I feel like they have a real story to tell. Where do you find the buttons? Nettie Kent: "Thank you! I started using the buttons in rings a few years ago after I been collecting them for a bit, the first one I made I kept for myself, this amazing old bronze lion head button, I wear the original but had so many people asking me for it that I cast the whole ring and offer it on my website. 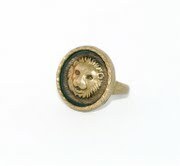 http://nettiekent.com/artwork/1896702_Bronze_Lion.html As I made more rings from the buttons I had collected people started giving me old button as gifts, I have so so many beautiful buttons in jars, some too precious to use!" PrivyDoll:What is your favorite piece of jewelry to make ? bracelets, rings etc? Nettie Kent:"I love to start a new piece, to begin with a sketch but then the real fun is in the wax carving, letting the piece unfold from the wax and often it will change from my intended idea and I love to work with the change see what happens, where it goes." PrivyDoll:Your pieces are very wearable- What clothing designers looks do you feel best fit with your jewelry line? Nettie Kent: "I hope for my jewelry to be transformed by the wearer, my Slice of Sand pendant is one of my most popular pieces and its such a simple piece and can look good with most things. When I am in full on work mode, which is all the time these days! I don't have the time to linger in my closet and this summer I have had a sort of uniform of vintage Levi cut offs and either a vintage blouse or tank. I do tend to keep my clothes more simple and concentrate on my jewelry and shoes! For this fall I have my eye on this amazing sheer black tank with leather detailing from SGC N-Y-C http://www.sgcny.com/shop/leather-cross-tank/ I love the simplicity of it yet it has total edge and interest with the sheerness and the leather, I'm sucker for clothes that incorporate leather! Also Christina Fan of C/Fan showed these high wasted black trousers that I am needing http://cfan-designs.com/ I could really go on here for a long time, I make jewelry but I love clothes so much, and shoes... don't even get me started, I'm not a tall girl so big shoes make me happy, I've been in heaven with all the platform and wedges offered lately, and the 70's vibe is my favorite, if I could choose an era to live in the early 1970's would be my first choice!" PrivyDoll: Where can we find your pieces? Nettie Kent: "All of my designs are available for sale on my website http://nettiekent.com/home.html My stock list is on there as well and growing everyday! one of the stores I work closest with is Dear Fieldbinder here in Brooklyn, they also have an amazing online shop http://www.dearfieldbinder.com/ and are the first to get new stuff from me! 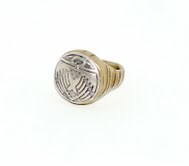 they are selling my thunderbird button ring exclusively http://www.dearfieldbinder.com/19718.html That is a very special ring with a very special story but its kinda a secret, I want my wearers to make up their own stories..."